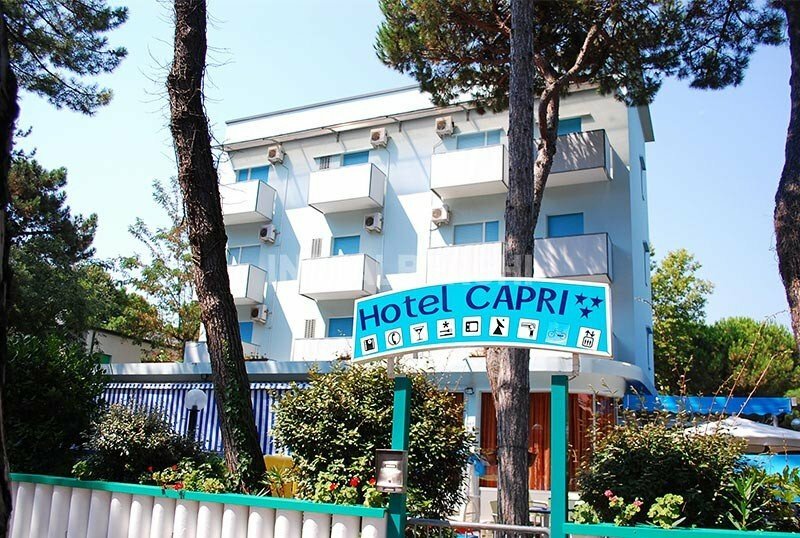 Hotel Capri is a family-run, 3-star hotel with air conditioning, garden, parking and WI-FI. It is located a short distance from the beach and the pine grove. No pets allowed. The hotel is located in Milano Marittima near the park of the Anello del Pino, a couple of minutes walk from the beach and about a dozen from the center. All rooms have a balcony, air conditioning, WI-FI, satellite TV, safe, telephone and private bathroom with shower and hairdryer. Paid minibar. Garden, open-air porch, terrace, free use of bicycles (also with child seats), reading room with newspapers in consultations, lift, theme nights. AIR CONDITIONING : throughout the entire hotel, free even in the room. SERVICES FOR DISABLED: entrance on the ground floor, elevator according to law. LUNCH AND DINNER : 3-choice menu, with buffet of appetizers and vegetables, homemade pasta and desserts, water included with meals. OTHER: once a week a pastry buffet is set up. In the hotel: outdoor playground area, strollers, bicycles with a seat, live entertainment. For a fee: baby sitter and pediatrician service. The hotel has an agreement with the Bagno Holiday Village which, in addition to sun loungers and parasols, has entertainment for children and adults, playgrounds, restaurant and bar area. At the establishment there is a heated pool with hydromassage, counter-current swimming, cervical waterfall, covered area and low water area for children (height 40 cm). Prices are per person, per day in full board for a minimum of 3 days.